This is the summary of consumer reviews for Honeywell Wi-Fi Programmable Touchscreen Thermostat + Free App (Model: RTH8580WF). The BoolPool rating for this product is Good, with 4.00 stars, and the price range is $109.83-$157.49. 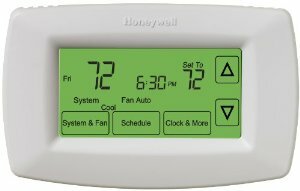 The Honeywell RTH8580WF Wi-Fi Programmable Touchscreen Thermostat + Free App helps in easy view and convenient control from anywhere anytime. It also keeps one alerted of temperature swings and make adjustments remotely. 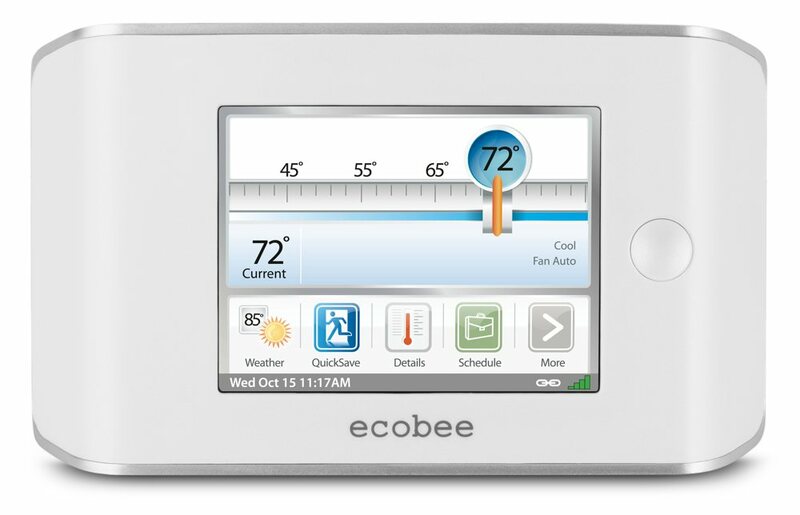 The Wi-Fi enabled thermostat allows remote access via smart phones, tabs or computer systems. It comes with a free app for Apple and Android devices and is Universally Compatible - meaning works with virtually any system type (C-wire required). 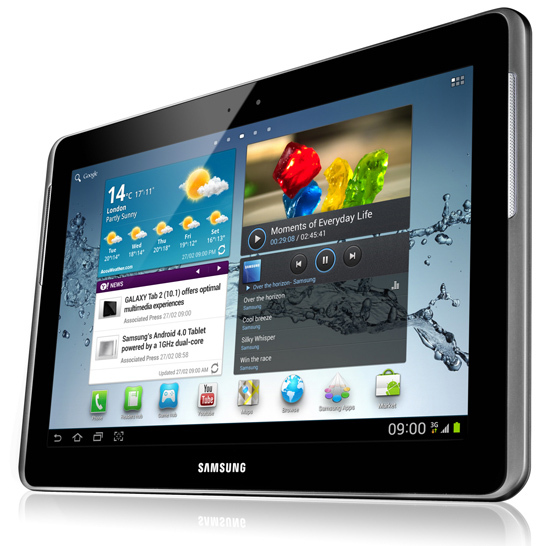 The device features a large easy to read touch screen display and a 7 day programming with 4 program periods per day. The device continuously pre-heat/cool homes as per the pre-programmed times with an energy savings of up to 33%. It is designed to download software updates and security through secured network by permanently and/or temporary hold. The device also provides the ability to view local weather from web portal or app. 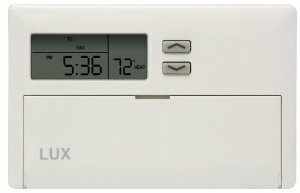 This thermostat is designed for intelligent alerts like high/low temperature notification of temperature swings and/or loss of Wi-Fi connection etc. Some other features include - filter change indicator; vacation programming feature; degree F or C temperature display and 12 or 24 hour clock display. However, some users find the Wi-Fi programming a little difficult to set up, and if the connection is lost to the router, then nothing can be done on the thermostat remotely. 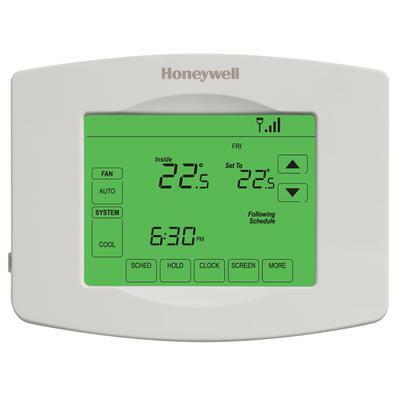 Overall, the Honeywell Wi-Fi Programmable Touchscreen Thermostat (Model:RTH8580WF) is highly recommended by users for its ease of installation and use, quality, reliability and versatility within affordable price range. I picked one up, watched the installation videos (10 minutes), and installed it in 30 minutes. My first full month heating bill after installing this Honeywell programmable WiFi thermostat showed a 45% reduction in average daily heat consumption. The unit has delivered rock-solid reliability, and has continued to function. It's very easy install once you do the homework and the versatility of controlling from a smartphone is second-to-none.After having an oil boiler replaced with a new gas boiler, I decided to become a bit more tech savvy and install the wifi-thermostat. If the instructions don't answer any questions, the website for the product will, it even has videos to help out with installation. Also contact customer service and asked questions about setting up the functions before I installed them. I installed it in my vacation home and now the house is cool by the time i a arrive. I look forward to seeing my electric bill after they've been installed for a month. I watched the installation videos and did it myself. I lost my wifi connection, time, and custom schedule. The thermostats don't keep their Wifi connection or reconnect if the Wifi connection is lost. It took me a while to work out the Aux/E connections, but everything seems to work.Setting up WiFi was where I encountered my first problem. 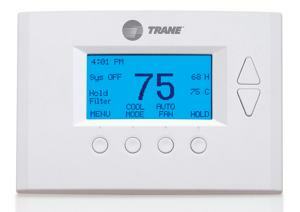 The thermostat function works fine and able to program without issues. But the WiFi connection is buggy and can't stay connected. The system is very simple and the user only needs a WiFi capable device (laptop, tablet, smartphone, etc.) You connect to the WiFi network created by the thermostat to select and configure your WiFi key. Thermostat lost connection to the router and nothing could be done remotely. First, the thermostat works well. So far, the thermostat works but haven't been able to get the wifi connected. Easy to install, and easy to setup. The thermostat is easy to install. I found the WiFi programmable thermostat easy to install and program. Easy to install and to adjust from smartphone. Easy to install because the directions are super detailed and easy to follow. It was easy to install and love that I can control it with my smart phone. Fairly easy to install and actually works as advertised. I'd a 4-wire HVAC system and the thermostat needs a 5-wire system (Common 24VAC wire). There are two separate wiring methods for conventional HVAC systems and heat pump systems. The unit DOES require a power wire from your HVAC system. The system requires power from your heating/cooling system. Meaning we know the AC isn't working, and we can take steps to resolve the problem long before we arrive home to a hot house.This thermostat works best if your existing thermostat has a "C" wire. But the instructions took me to a helpful web site that'd instruction videos that showed me how to do some simple wiring to use a 4-wire system to make the thermostat work. The mounting plate has clearly marked terminals where the wires go for both conventional and heat pump installs. I don't know I never thought about buying these sooner!The install can be simple or lightly less simple depending on how you AC system is wired. I wish the box had been more clear on what exactly a "C" wire was, and possible barriers to installation.For modern HVAC units, this's probably a super quick and easy installation that can be done by anyone. Purchased the next cheaper model (RTH6580WF), wired it up, attached to wall plate, connected to WiFi and it's working like a champ. Is the 8580 3h2c compatible?